As the Bespoke Conservatory by its very nature is unique. it means there are very few restrictions as to the size, shape and use for them, unusual and striking designs would be the norm. Given the nature of the design & construction of some Orangeries, you should be aware that it can take longer to complete the project, as this type of project is sometimes more complex. Bespoke conservatory designs are those which don’t quite fall into any of the other categories and may be a combination of a few styles or something unique. In terms of what they look like, it’s really up to you and your budget. P, T or, L shaped conservatories would tend to be classed as bespoke as they are often fitted into unusual areas and tend to be “custom built” than “off the shelf”. A more conservative approach may be to opt for the Orangery Conservatory which features pillars and “atrium” type roof openings in their design. Offering a lot of individuality and style, Orangeries are known for giving a more private feel due to the use of pillars, but they still manage to remain light and airy as a result of the atrium roof / ceiling design. It is the inclusion of pillars that allows tilt & turn, sash or casement windows to be incorporated into the design – and no matter if they are free standing or joined to the existing property. 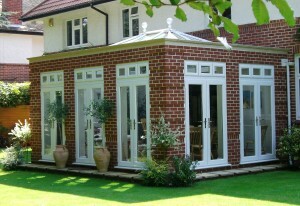 Orangery conservatories could well be a more cost effective solution to creating more space than a typical home extension. Probably the most common D.I.Y. conservatory in the market, with lots of options for pre-made bases which are simple to install. However, if you want better quality frames & glass or if you need light & power, then getting it done professionally is the best option. 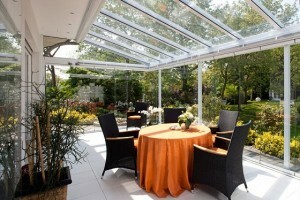 Lean-to Conservatory prices, even from UK installers are some of the lowest of any conservatory design. Lean-to Conservatories could be considered as one of the simplest designs and are very useful for homeowners who wish to simply add a small room to the back of the house. Most are built to be square or rectangular, with full glass sides and a simple sloping roof. A variation on this theme is the Veranda Conservatory, this design has the featured roofing bars extend over the front frames, bringing the roof glass further out over the edge of the roof to create a protected area where you can sit outside but still enjoy protection from the weather. 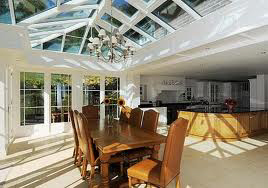 If you want to find out more on Designer & Orangery Conservatory Prices, simply take a few minutes to send us your enquiry and we will arrange for up to 3 trusted installers to provide you with written quotes.